Thinking back 15-20 years, I remember my parents going about their morning ritual of brewing coffee on weekends before burying their faces into a newspaper. It was probably how 90% of households in Germany brewed coffee at the time, using an old school batch coffee brewer. I’d watch them pour water in a jug, add ground coffee from the supermarket to a Melitta filter and push a button. Scales or thermometers to measure the precise amount of coffee or temperature of water were unheard of. And the result was, quite frankly, a bitter, dark brew that I’d avoid like the plague. Needless to say, filter coffee didn’t have the best reputation. It wasn’t until the third wave rediscovered pour over methods that had once before enjoyed popularity during the middle of the 20th century, that the perception of filter coffee changed for the better. I am talking about the Chemex, V60 and Kalita Wave. Especially at the beginning of the third wave this gear helped specialty coffee shops to visibly differentiate themselves from regular coffee shops. Until today, you’ll find either one of these and/or the Aeropress in the majority of specialty cafes. However, I’ve also witnessed more and more third wave coffee shops relying solely on batch brew, one example being Bonanza in Berlin Kreuzberg. Progress and innovation have slowly improved the negative perception of batch brewers. Prominent automated pour over systems are increasingly found in homes of coffee enthusiasts and in third wave cafés. This article is taking a closer look at this battle of man vs. machine. I talked to baristas and coffee shop owners to explore their reasons for preferring one over the other and put together lists of the pros and cons. Martina is running Retrogusto, a small take-away coffee place in the Mercado Central of Valencia. Despite the fact that it can get incredibly busy, she keeps pour-overs on the menu. Recently, Retrogusto has introduced batch brew for customers who are on the run. Nevertheless, she prefers manual brews when time allows because it allows her to control every valuable of the brew. Wattanaphon Khamson is a barista at Omnia Cafe in Chiang Mai. His main reason for preferring pour over rather than batch brew is that the manual brew allows him to experiment with brewing techniques and adjust quickly to the particular coffee beans he is brewing. As an example, Wattanaphon seeks to improve the taste of every coffee by adjusting the ratio of the coffee and water during the blooming stage and the amount of seconds he allows for blooming. While it is mostly possible to adjust the settings of the batch brewer to do the same and to save different profiles for different kinds of coffee (depends on the kind of batch brewer of course), he finds it easier to experiment manually. In the Asian countries where I’ve researched the coffee scene - Thailand, Taiwan and Japan - batch brew is almost unheard of and especially in Japan and Taiwan pour-overs are incredibly popular. By manually brewing coffee the barista can create an experience for customers. 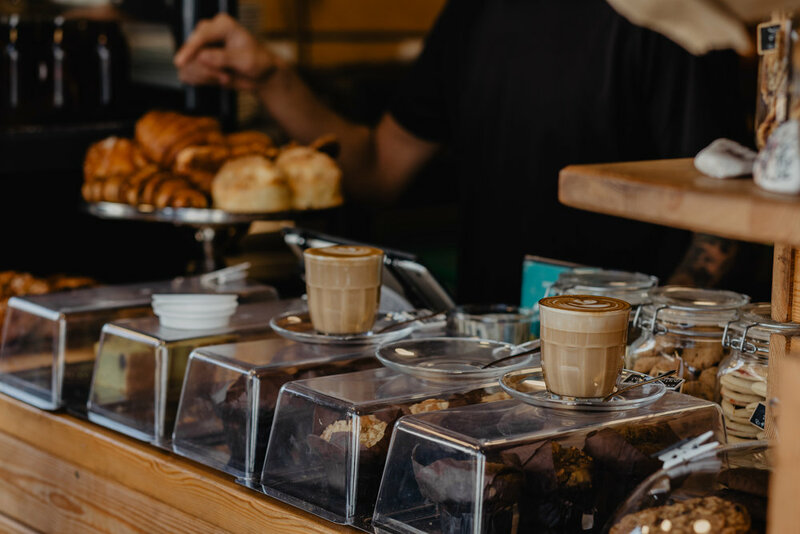 Apart from the actual taste of the coffee, the human element can be a decisive factor when it’s about whether a customer would come back to a coffee shop or not. The manual brew allows the barista to control and adjust every valuable of the brewing process in the moment. When time allows, the barista can customize the brewing depending on the preference of the customer. Some cafés offer a variety of single origin beans, sometimes as many as 10 or 12. By doing pour-overs the barista can make quick adjustments to each brew depending on the coffee beans. Pour-over gear is much more affordable than decent batch brewers. However, the time spend preparing pour-overs might be more costly than using batch brewers. 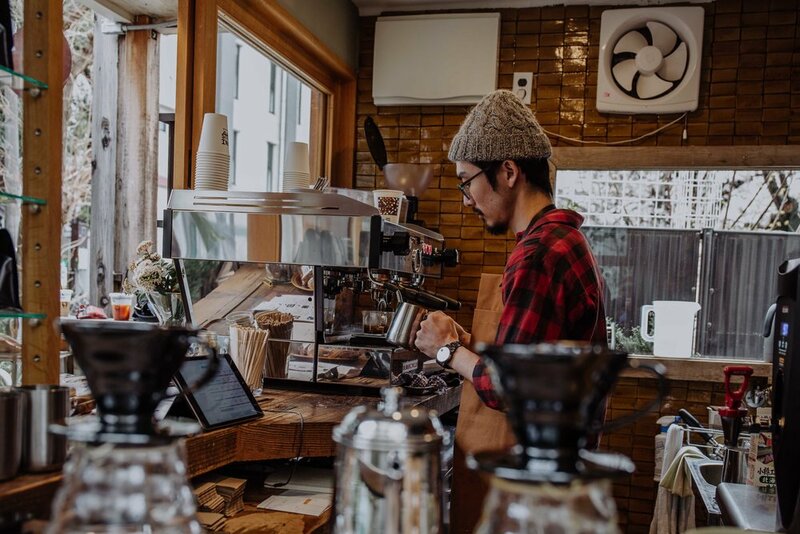 When a café is crowded and there is a number of people ordering pour-overs manual brews can become very time consuming and increase waiting times for customers. Consistency is a challenge, especially during rush hours when the barista doesn’t have enough time to give your brew the attention it needs. While baristas put more effort and time into manually brewing coffee for their customers, many customers might not actually taste the difference between a manual brew and an automated brew. If too much emphasis is put on the pour over method it might end up distracting the customer from the actual coffee and its qualities. David, the owner of Just Coffee in Zurich, is a batch brew enthusiast. Once the recipe is set and the coffee has been dialed in, the same quality will be achieved batch after batch, quick and easy. If the coffee shop is high volume, batch brew guarantees consistency for each cup of coffee. Even though a decent batch brewer will cost much more than pour over gear, time and consequently money might be saved in the long run. Baristas might engage less with customers when serving batch brew rather than pour-overs. At the end of the work day there will be more coffee wasted with batch brewers if it doesn’t sell out. Depending on the practices and standards of each coffee shop, there is a chance that your batch brewed coffee is not fresh. The longer it sits in the brewer the lower the quality becomes. Serving a variety of filter coffees requires almost an equal amount of batch brewers in order to serve a range of filter coffees in a timely manner. When deciding on whether to go for batch brew or pour-overs in a café, coffee shop owners might want to consider offering both. The specialty coffee lover Dani Bordiniuc is a barista at Lot 61 in Amsterdam, a high-volume specialty coffee shop in a prime location. “I think it depends on the environment you’re working in, how much staff there is on the bar and how busy it gets. At the end of the day, you want to make customers happy and serve a consistently delicious filter coffee. I’m currently working in a café that can become extremely busy at times. Therefore, in such moments, when there are so many things to look after, I’m recommending batch brew. It’s always fresh, delicious and above everything else, it’s consistent. As much as I hate disappointing a customer for not being able to prepare it manually, I’d equally dislike serving a subpar pour over coffee. 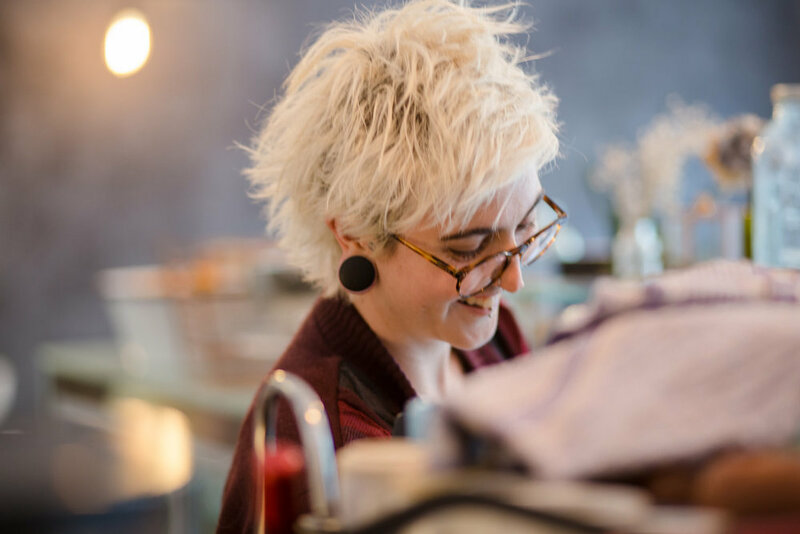 On the flip side though, when it’s a quiet moment in the day and I can focus 100% of my attention on the brew bar, I’m more than happy to prepare and serve a manual pour over.” Dani is keeping a Brew Journal at Coffee & Stories. Go check it out to see what coffee he’s been brewing and get inspired. You’ve decided which method is right for you and are looking for the right gear? I’ve found the article ‘Best Coffee Makers 2019 – Buyer’s Guide and Reviews’ to be really helpful in deciding which coffee maker to buy for home brewing or commercial use. For a little more background about pour over, Perfect Daily Grind just published the article ‘Melitta, Chemex, & More: A History of Pour Over Coffee’. If batch brew is what you’re opting for, the article ‘How to Improve Your Batch Brew Coffee’ by Perfect Daily Grind is a great resource to improve your coffee using batch brew at home or at a café. Is batch brew going to dominate the specialty coffee scene in the future while pour-overs become a domestic tool for hobby brewers? Let me know what you think in the comments! The Chemex is the kind of coffee maker that is repurposed in the most creative ways due to its timeless design and elegance. Whether its turned into a vase or a lamp hanging from the ceiling, the opportunities to make use of it seem endless. It was designed well before I was born, in 1941 by the German scientist Peter J. Schlumbohm to be precise, but is hardly ever missing on the shelf of a third wave coffee shop today. It is my favourite brewing method as it produces an incredibly clean cup with light body while emanating pure sophistication. During a recent visit to Factory, one of my favourite specialty coffee shops in Bangkok, the Thai Barista Champion Athip Archalerttrakool brewed a single origin coffee from PangKhon, a coffee region near Chiang Rai, Thailand, for us using the Chemex and shared his recipe. For this coffee beans of mixed varietals were processed using the black honey method and the flavours to be expected were orange, sugar cane and black tea. Athip weight 20g of beans, ground them coarsely and let us smell the freshly ground beans. The kettle he used is from Brewista, with which he heated up the water to 93 degrees. For this recipe Athip was using 280g of water plus a little extra for saturating the filter before the brewing. The brewing time was 2:30mins. First things first. After placing the filter Athip rinsed it with hot water to eliminate any unwanted taste from the paper while warming up the glass at the same time. This water was then discarded. Next up he poured the ground coffee into the filter followed by double the amount of water, which he gently poured in circles starting from the center moving outwards. He waited a bit over 30 seconds to let the coffee ‘bloom’, before continuing to slowly pour water in circular motions, taking breaks of a few seconds in between pours. After all of the water dripped through the grounds he discarded the filter and poured the coffee in a cup for us. We enjoyed the fruity after taste of this coffee that had little acidity. Notes of black tea were very present in the cup and I tasted the orange flavour a bit more after the coffee had cooled down. Athip Archalerttrakool is the co-owner of Factory and has experience working as a barista for over 5 years. I photographed his performance at the World Barista Championship in Amsterdam in June 2018 and was so excited to see him brewing again here in Bangkok. Kop khun mak ka! Check out my travel and coffee guides in Thailand! Bangkok and I go way back. I spent a year in Bangkok studying at Chulalongkorn University and doing a traineeship in 2011. Since then it’s been close to heart and started to feel like a second home, which is why I came back every single year at least for a few days. Returning to Bangkok has become even more exciting ever since I started writing about specialty coffee. The local cafe scene is thriving and while new and innovative coffee shop concepts keep popping up, I also see the already existing ones constantly moving or improving. If you’re visiting Bangkok for the first time, you’ll find vibrant neighbourhoods well beyond Khao San Road. My favourite districts for visiting cafés are Ari, Phaya Thai, Sukhumvit, Silom and Sathorn. There are also a couple of wonderful cafes in the area behind Hua Lamphong station. In this article I want to take you on a little journey to Bangkok’s most exciting neighbourhoods and their specialty coffee shops. As a little side note, importing coffee from other parts of the world is quite expensive in Thailand due to heavy tariffs. Most cafes you’ll visit feature coffee beans from Northern Thailand, either as single origin or as part of a blend. To add a bit more complexity to the cup many roasters blend Thai coffee with beans from Ethiopia, Brazil or Colombia. You’ll find the owner Thanapong hand grinding your single origin beans for filter coffee. For espresso they blend four different origins to produce a balanced cup. Beautiful space and a relaxed atmosphere guaranteed! Creative space serving beans roasted by Ristr8to from Chiang Mai. Great for working on your laptop. Ceresia have a great selection of single origin coffees from across the coffee belt. Watch the roasting action on site through the giant glass window. The best address for signature drinks in Sukhumvit! The owner Jay, his wife and best friend have opened up the cafe in autumn 2018 and design drinks inspired by flavours to be found in coffee beans. Their mission is to extract these flavours by adding a little extra. The coffee shop features multiple roasters and a variety of single origins that rotate every two to three weeks. This haven for brunchers, lunchers and diners has two locations in Sukhumvit, one in the shopping mall EmQuartier and one at the concept mall The Commons. Pacamara has, as many other established specialty coffee shops in Bangkok, discovered the advantages of being located in a shopping mall and consequently opened the luxurious CAFE LEITZ in the Helix Quarter across from Phrom Pong BTS station. The menu was particularly designed for this branch and holds fusion dishes for breakfast lunch and desert. The exquisite selection of single origins for filter includes acclaimed international beans such as Ethiopia Guji and Thai beans from the coffee regions Doi Chang and PangKhon. For espresso the choice is to be made between a house blend, classic blend and a rotating single origin. Casa Lapin is a roastery and specialty coffee chain with several cafés around Bangkok. The one nestled away in Soi 26 is adjacent the pretty hostel and co-working space One Day. Located in the lifestyle mall Seenspace in Thong Lor, this branch of Brave Roasters is famous for its signature drinks, such as the smoking iced Fume de Latte and Mocha. There are also different kinds of craft beer available to taste-try. Minimal design, hand grinding and drip coffee only. This Instagram darling is a popular choice for cafe hoppers. Pioneer artisan coffee roastery and Malay family affair operational since 2011 that currently offers single origins from Chiang Rai, Ethiopia, Rwanda and Kenya. They became the 1st runner-up at the Thai Coffee Roasting Championship 2018. Cosy micro-roastery café in Ekkamai that has been around since 2013. One Ounce for Onion is sharing the space with a multi-label store in a quiet Soi in Ekkamai. Super cosy place with great food, coffee and local vibes. This hipster hangout spot in Ekkamai is moving (December 2018) and I’ll hopefully get to show you the new space next month. Roots is arguably one of Bangkok’s finest coffee roasters. It is located in the concept mall The COMMONS. While there is certainly no lack of shopping malls in Bangkok, The COMMONS stands out for its community centered approach and the plentiful outdoor seating where you can hang out even if you don’t decide to shop anything. I had the opportunity to go on an origin trip to Northern Thailand together with head roaster Korn, which you can read about here, and saw first hand that Roots carefully selects only the best quality coffee. They are also the first specialty roastery to exclusively roast coffee from Thailand. As Korn told me, the quality of coffee in Northern Thailand has improved a lot over the last couple of years, a development that the roastery is strongly supporting. Roots have opened up a second location in Sathorn. The financial district of Bangkok might seem like a jungle made of office buildings at first, but if you venture far enough, you’ll stumble upon art galleries, Hindu temples and great coffee shops. Strolling down Pan Road and visiting the Kathmandu Photogallery is a must when in the area. Around the impressive Sri Mariamman Temple you’ll feel teleported straight to India, only to be reminded by local street food vendors that you’re actually in Bangkok. Silom is a neighbourhood that can be described as beautifully diverse. As the sun sets it starts bustling with market and food stalls appearing in an instant, and during the day the following coffee shops are a great draw. A must for those who appreciate minimalist design. This coffee shop in deep greys and sleek blacks has two grinders, one house blend made of Brazil, Colombia and Thailand and a guest blend with specialty coffee from local roaster friends. Sathorn can be described as the laid back older sibling of Silom, slightly more grown up but equally diverse and interesting to discover. While it is a center for business and high-rise buildings, there are just as many residential areas in this neighbourhood that are often overlooked by visitors. Get lost in the alleys, immerse yourself in the local way of life and refresh at these specialty coffee shops. Adjacent of All That Bangkok Hostel, this neighbourhood coffee shop is a great place to venture to. It is right in the middle of a residential area and local life will pass by while you sip on nitro cold brew. All day breakfast and single origin coffee from Colombia, Ethiopia, and Thailand. This is one of two branches in Bangkok. Chit Lom and Phloen Chit have probably the highest density of shopping malls and luxury hotels per square meter. It’s not surprising that the two specialty coffee shops in this neighbourhood are also located in shopping centers. The area is filled with expats in business attire as it houses a number of embassies. The are a few local markets, food stalls and restaurants around, but most of the establishments are high-end. Coffee shop located in the Central Embassy mall with a one-of-a-kind counter. The owner has a coffee plantation in Chiang Dao and serves his coffee at Coffeeology. The farm is illustrated on the walls and with lots of imagination you can transport yourself there. Come here for a true seed to cup experience. Did I say Chit Lom has the highest density of shopping malls? Siam is definitely competing for that title, but shopping here is slightly more affordable, apart from the luxurious Siam Paragon. There is always something going on at Siam. From the BTS station you’ll see crowds of people pressed against a stage on most days, even though you’ll probably never figure out why they are there. Siam is also where to find the Bangkok Arts and Culture Center (BACC), which has different exhibitions going on that you can visit for free. Two great specialty coffee shops are to be found here, one in Siam Discovery Shopping Mall and one in the BACC. A branch of Brave Roasters located in the shopping mall Siam Discovery. Filter coffee only at the BACC (Bangkok Arts and Culture Center). In recent years the neighbourhood around Phaya Thai and Ratchathewi BTS station has seen more and more designer hostels popping up in small alleys amidst local houses, markets and restaurants. Close to Phaya Thai is where I used to live when I studied in Bangkok and I always stay here when I return, partly for nostalgic reasons, but also because some great cafes and restaurants are to be found in the area. Nowadays, these following specialty coffee shops make the Phaya Thai neighbourhood even more attractive. Siam has long lost its hipster crowd due to the commercialisation of the area. Where did they go you ask? To Ari, an area that has developed at a slower pace than other parts of Bangkok. From local street food to chic restaurants, Ari offers something for every budget. Last but not least, these cafes serving specialty coffee make Ari the place to be! FabCafe is a concept cafe serving excellent brunch and lunch options. It’s a quiet and airy space perfect for working. Infact, there is a designated space for guests to use laptops. The coffee is equipment is top notch, but the result in your cup really depends on who’s serving it. Welcome to Tel Aviv, the Middle Eastern capital of cool, where everyone seems to be getting around on two electric wheels, own a dog or both! The city that greets its visitors with delicious hummus, sleepless nights and thought-provoking street art won my heart over in no time. Although it has the reputation to be a party town, and very rightfully so, there is much more to Tel Aviv than a lively bar scene. I’ve discovered some of the city’s best coffee, breakfast, and accommodation in the maze of local hipster hangout spots and put together this coffee and travel guide for you. Enjoy! Here’s where to sleep, sip and refuel in Tel Aviv! 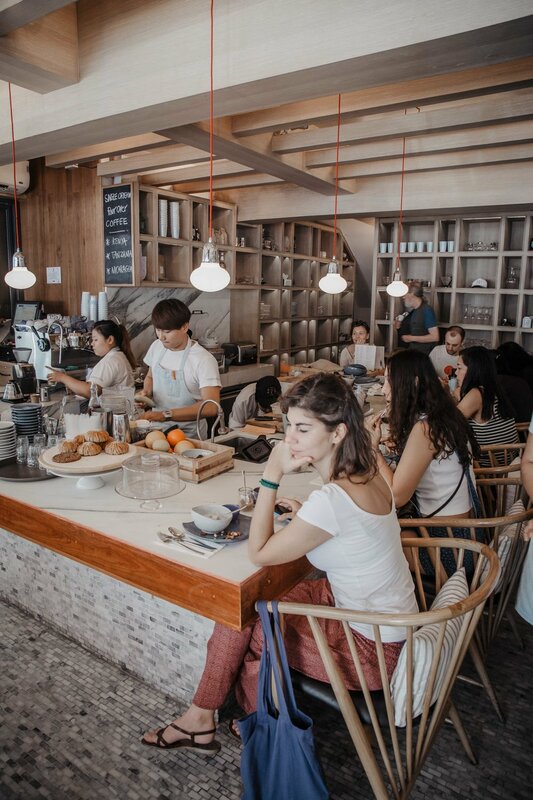 Apart from being a culinary hotspot and beach destination, Tel Aviv is also densely populated with coffee shops. When I ask Israelis how they like their coffee, I almost always get the same reply: dark and strong. If that is not your cup of coffee, then head to the specialty coffee shops I am introducing in this article! Although they also tend to have at least one option adapted to the general taste preferences, they offer fruity alternatives that spin the wheel of flavours. Most coffee shops in Tel Aviv have plenty of outdoor seating and working on your laptop is widely accepted. Cafelix is no exception and with three branches across town you’ll very likely come across one near you at any point of time, whether you’re in Jaffa, Florentin or around Dizengoff Square. Jaffa is where the first coffee shop and roastery was opened back in 2011 by the owners Phillip and Yael, a German-Israeli couple. Today, the roaster moved around the corner from the original place into a newly opened roasting facility and training space. Cafelix has direct trade agreements with farmers across the coffee belt and there are two different origins in the grinders to choose from for espresso based drinks. Even though filter coffee is only ordered occasionally, a V60 and french press are sitting on the shelf just in case. With two house blends and seven single origin coffees Nahat has some of the biggest selection of coffee beans I’ve seen in Tel Aviv. Since 2015 the cafe and roastery sits right on Dizengoff Square in the heart of the city. The owners Dan Urieli and Assaf Bitton are coffee experts with more than 15 years of experience. Judging from the juicy cup of coffee from Burundi I got to enjoy here, all these years of hard work paid off! Taking a seat on Nahat’s terrace is not only recommended because of the extensive coffee menu. With views of Dizengoff square's ‘Fire and Water Fountain’ and the original Bauhaus-style building ‘Cinema Hotel’, an afternoon here seems to pass in an instance. Oh and don’t miss out on the freshly baked croissants and cookies! WayCup Coffee have two locations in Tel Aviv and my favourite is without a doubt the one on Mikveh Street. In terms of aesthetics it’s distinguishing itself from other coffee shops in Tel Aviv thanks to a mix of bare concrete walls and wooden features here and there, making it cosy and contemporary at the same time. The laptop stands and plants hanging from the ceiling add to the feeling that you’ve entered an urban jungle playground. All coffee is roasted in-house at the location in Yohanan HaSandlar Street and is admittedly on the darker side, despite being specialty graded. You’ll meet some of the most friendly coffee people behind the bar though and if you’re looking for something different they’ll go out of their way to brew you a coffee that‘ll make you come back. Like Yuval for example, who shared that even though espresso based drinks are the main reason people go to WayCup, the number of filter orders is growing. To accommodate those, a V60 is their filter method of choice. Having mentioned that filter coffee is not all too popular in Israel yet, perhaps you’re wondering what might be the best place in Tel Aviv for filter coffee!? Well, the answer to that is Coffee Shop 51. No other cafe in Israel serves as many hand brewed coffees. Passionate coffee expert and owner of Coffee Shop 51 Dotan estimates they brew around 50 filters a week. Being from Berlin that doesn’t sound like much, but filter coffee hasn’t experienced the same break through in Israel as in other parts of the world. The cafe and roastery can also be considered a third wave pioneer. It started out in 2015 when the third wave coffee scene just started to blossom. Coffee Shop 51 is a great place to train your palate if you opt for a filter coffee. There are currently 10 single origins to choose from, all roasted on site using a 2kg micro-roaster. “There are no rules about roasting coffee in Israel." Dotan tells me. This explains why all coffee shops I visited roast their own beans rather than featuring guest roasters. Dotan, who started to work as a barista right after completing the army service, received most of his coffee education abroad. He’s in the process of making direct contacts to farmers and started producing third wave water, which is a novelty in Israel. Chances are, you’ll walk by the entrance of Edmond Coffee a few times before stepping through the dark hallway leading to this hidden courtyard cafe. Once you do, unique tiles, vintage furniture and lush greenery awaits you on the other side. While the coffee didn’t knock me off my socks, the avocado toast sure did the trick. As all the other specialty coffee shops Edmond Coffee roasts their own beans. They do have some of the darkest roasted specialty coffee I’ve found in Tel Aviv, but by the second time I visited, the barista immediately recommended a single origin from Guatemala that would be closer to my personal preferences. The menu holds a few gems to be tried if you’d rather skip the coffee, like homemade kombucha and iced almond matcha latte. Cold brew, V60 and Chemex are available if a caffeine fix is what you’re after. Head to Papua Cafe Tlv for a specialty coffee break close to the beach! The little wooden cabin-like coffee shop is definitely the perfect place for sunny days as it is open air, but plastic covers make sure that you can spend a rainy few minutes here as well. Two options for espresso are available and the coffee is roasted by friends of the owners specifically for Papua Cafe Tlv. There’s so much to discover in Tel Aviv that I’d definitely recommend to spend at least a couple of nights here. On my search for unique options for accommodation I came across Florentin House, a boutique hotel/hostel located in the coolest part of town. As they say: “New York has Williamsburg, London has Shoreditch, Tel Aviv has Florentin!” Whether you’re looking for a private room to call your own for a few nights or you’re eager to meet other travellers in a shared dorm, Florentin House has comfortable options for either. The rooftop kitchen & saloon is a great spot to unwind after a busy day exploring coffee shops, designer stores and small galleries nearby. Being on the road a lot I appreciated the incredibly welcoming atmosphere and felt right at home thanks to comfy beddings, urban aesthetics and the authentic spirit of Florentin House. Check the latest rates and offers for Florentin House here. One of the awesome staff at Florentin House (Hi Kim! :-)) recommended visiting Urban Shaman for breakfast. As in locals I trust it made my list of places to go to while in Tel Aviv. After scouting through their creative menu I opted for the pancakes and they were divine to say the least. Apart from cold brew you’ll find that coffee has been replaced with cold-pressed juices and Maca lattes. But that doesn’t come as a surprise when learning that it’s a place for healing and healthy living. Come here and you’ll might just find your inner Shaman. The cafe and concept store Makers Green Coffee and Plants is just over 3 weeks old and already made it onto the pages of Israel’s Time Out online magazine. While the coffee is not specialty graded, they do serve a balanced cup with chocolately finish. The coffee is an Italian espresso blend roasted by DITTA from Salerno. Come here to sit on the comfortable sofa amidst plants and flower pots for a guaranteed feel-good atmosphere. A must-try is the locally made kombucha from nearby “Golden Sun Café”. In Bern the pace of life is synched with the crystal-clear turquoise waters that flow through it. River Aare is gently hugging the historic center of the Swiss capital and invites the adventurous to jump in and be carried away by the currents. Never skipping a coffee break is as much part of daily life as reading a newspaper in a cafe or enjoying lunching out with colleagues. Whether you’re after a city stroll, bathing session or both, here is where to refuel with a quality cup of coffee before or after going into explorer mode. The Bern based family company ‘Blaser Café AG’ has been roasting coffee commercially for several generations. In 2014 they jumped on the third wave of coffee with the opening of the specialty café RÖSTEREI. It is located right next to the company factory outside of the city center. The surrounding area is rather industrial but it’s worth it to venture out here for a quality cup of coffee. RÖSTEREI is showcasing Blaser Café’s specialty coffee line ‘Terroir’ and several coffee machines for home brewing, including Moccamaster and La Marzocco. The roasting of the Terroir coffees is done at RÖSTEREI rather than in the adjacent factory building. Up to six single origins and plenty of filter methods will leave you spoiled for choice. Apart from Chemex, Kalita, V60 and the Syphon, RÖSTEREI also specializes in brewing an authentic Turkish Coffee. If you’re working in the area or just want a hearty snack, there are a few lunch options available too. If you prefer to stick to the center, RÖSTEREI is sharing a space with Reinhard bakery to offer their coffee closer to the heart of the city, near the train station and other points of interest. You’ll find the design here to be very similiar to their main cafe. Apart from coffee and baked goods there’s a small retail section offering your favourite coffee makers as well as roasted beans. As the name suggests, coffee isn’t all you’ll find at this corner cafe and bar. Functioning as a subsidiary of the Berner institution Adrianos Bar & Café, Colonial is actually located right across from its mothership. Adrianos has been around for more than 20 years, and, although slowly adjusting to occurring coffee trends, is still leaning towards the Italian way of making coffee in their cafe. Colonial on the other hand serves estate coffee only and has been doing so for 2 years. Espresso based drinks, cold brew, craft bear and aperitifs make up the bulk of the menu. All coffee is sourced directly and roasted by Adrianos and single origins include Ethiopia, Costa Rica and Sumatra. You’ll see locals popping in to take a seat at the counter by the window, croissant in one hand and newspaper in the other. On warm and sunny days the terrace is the perfect place to stick around for a while. While in much of Switzerland there isn’t a great variety of specialty coffee shops, Zurich turned out to be a real coffee hub. It has three barista champions among its coffee folks. Emi Fukahori (2015) and Mathieu Theis (2016, 2018) have just opened their second café MAME this year, while Shem Leupin (2013), roaster at Stoll Kaffee, and his partner are running the specialty café COFFEE. With Zurich being part of the co-working network IMPACT HUB, two of their locations have uniquely designed specialty coffee shops attached. And lastly, Zurich has its own coffee lab providing barista trainings and workshops. Here’s your ultimate guide to quality coffee and cafés in Zurich. Emi Fukahori from Japan and Mathieu Theis from France opened up the first MAME two years ago. Mathieu came to Switzerland as an engineer. When he got tired of his job, he took a career break and that’s when he first discovered specialty coffee. Partner Emi worked in the tourism sector when she discovered here love for specialty coffee and competitions in Zurich. The rest is history! 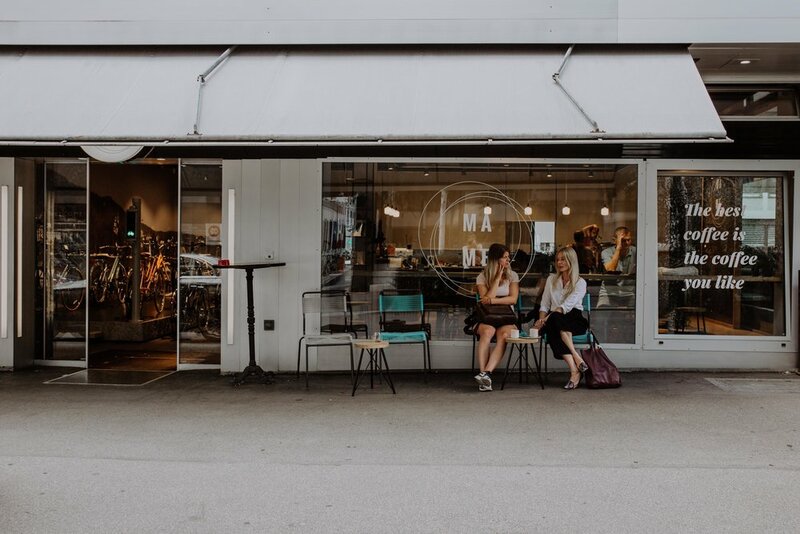 Their second cafe Mame Seefeld was inaugurated in June 2018 and became the first coffee shop in Switzerland to be brewing filter coffee exclusively with the GINA coffee maker for better consistency. Both Emi and Mathieu had the chance to taste incredible coffees while competing in the national and world barista championships. At MAME they wanted to make these coffees accessible for their guests because, as Mathieu says it, “There is no reason not to do it!”. “We offer a lot of different flavours to our customers. We removed the origins completely from our menu and only talk about flavours.” Having seen his performance at the World Barista Championship 2018 in Amsterdam I was uber excited to be sipping Mathieu’s competition coffee on site, which was roasted by Keen in the Netherlands. More precisely it was a coffee from Costa Rica that boosts incredible notes of cinnamon thanks to a particular fermentation process (natural anaerobic fermentation to be precise). In the meantime a young chap approaches the counter and asks for chocolate flavours in his coffee. “Yesterday’s coffee was great, those nutty flavours really stood out. Today I want to try something different”, he says. Mathieu knows right away what to prepare, weights the shot, adds two more coffee beans to the grinder to be precise and pulls the shot with the utmost attention. What makes MAME successful, apart from the perfectionism that flows into every detail, is the fact that it provides an incredible customer experience that I’ve only witnessed once before, at Koffee Mameya in Tokyo. By the end of the year the duo wants to open their own roastery. It’s Mathieu’s goal to be the one roasting Emi’s coffee for the 2018 World Brewers Cup taking place in Brazil. Best of luck to both of them! If only all things in life were as simple as finding a good brew at COFFEE, whose simplicity in branding and interior is a nice contrast to the complexity of its coffees. The cafe has been around for more than two years and was co-founded by Shem, who is a roaster at Stoll, and Thomas, who has worked as a star chef. The barista on duty the day I visit is Yves, who has close to 10 years experience working in coffee. “The Swiss coffee culture is old-fashioned. People are afraid to disembark from the ‘caffè crema’ culture that is prevailing.” It was really interesting to listen to Yves talk about two completely different coffee scenes that started to have some overlap only in the last 3-4 years. At COFFEE everyone tries to be as progressive as possible and to perfect and control every aspect of brewing coffee. The coffee available is roasted at Stoll by Shem and there are always several options for espresso and filter in the grinders. As the name predicts, Just Coffee have set a clear focus, and while there are some home made baked goods available, coffee is in the spotlight here. Founder David from the UK has been a coffee enthusiast since the 90s and could be described as an ambassador for batch brew coffee. His goal is to make quality coffee accessible to everyone. When he was still working in finance he started doing all the SCA (Specialty Coffee Association) qualifications before taking a leap of faith and opening up Just Coffee 7 months ago. “Our house blend is more of a crowd pleaser, while the guest espresso is interesting to those who want to experience different flavours.” As he likes to experiment himself, you might find as many as 3 types of cold brew and espresso on ginger beer. While V60, Chemex and Aeropress are on the menu, David is a big fan of batch brew. When a customer walked in with her cup and poured herself some coffee to take away, David’s face lit up. He’ll give you a discount if you bring your own cup! Bovelli serves coffee during the day and cocktails during the evening hours. The classy cafe has been operating for 3 years and serves espresso based drinks only. The menu differentiates between a classic espresso, which will be a darker roast, and a modern option, which will have a more fruity character. Bovelli works with Henauer and Stoll exclusively, which are both renowned specialty coffee roasters in Switzerland. The cafe is somewhat of a gateway to third wave coffee and does a great job at creating a bridge between the two co-existing coffee scenes in Switzerland. After driving around Zurich with a coffee truck for the last 3,5 years, Miró’s owners David and Daniel have found a permanent home for their coffee in June this year in the Langstrasse neighbourhood. Miró Coffee is a specialty coffee roastery and cafe working with small farmers and cooperatives in producing countries. They even have a direct trade relationship with a coffee farm in Nicaragua. Their fair trade, organic and sustainably grown beans can be found in over 20 cafes around Zurich, Winterthur, Lucerne, Basel and Geneva. For their first permanent location the brothers launched an open call for architecture students and alumni from the ETH University in Zurich. The result is an open space with minimalist design and industrial features. Miró doesn’t compromise when it comes to roasting specialty coffee, you’ll find that medium roast is the darkest they’ll go. “We have to talk a lot to customers about our coffee. They often don’t know how many different flavours coffee can have”, David tells me. Apart from espresso and filter options, including Kalita, V60 and cold brew, the menu holds coffee cocktails as well. The idea is to offer coffee-related aperol in the evening hours and brunch on weekends. The specialty coffee shop Auer & Co. shares the space inside an old brick building with the co-working space Impact Hub Zurich. Whether you want to become a member of Impact Hub and have great coffee nearby or take advantage of the working atmosphere as a café guest, you’ll be more than welcome to linger in this creative location. Auer & Co work with Miró Coffee and have two single origins on the menu. They’ve also go you covered with several options for a hearty lunch. There really is no good reason to not spend all day here. The cafe, restaurant and event space Kraftwerk has given a former power station a new and innovative purpose! Similar to Auer & Co it shares the space with the co-working space Impact Hub. The location with its integrated shipping-containers that function as offices and meeting rooms is pretty spectacular. During the day you’ll find the perfect atmosphere for working on your laptop, even if you don’t make use of the co-working space. I found Vertical Coffee Roasters, a specialty roastery from Unterlunkhofen previously known as Gipfelstürmer Kaffee, to be featured here. Just one question left to ask - can Kraftwerk be shipped to Berlin so I can keep coming back here? If after drinking all those delicious coffees you’d want to learn more about the art of brewing it, then check out Coffee Lab Zurich. They offer everything from barista courses, sensory classes to latte art workshops and more. Every other Saturday the Coffee Lab is open for the public to try taste a different guest roaster. Check their Facebook page to find out when the next workshop or tasting takes place. This article is part of a series of coffee stories from Switzerland. Schweiz Tourismus have been amazing in supporting this project. You can find more information about tourism in Switzerland here: www.myswitzerland.com. Breakfast and brunch cafés serving specialty coffee are not that easy to come by. Many specialty coffee places concentrate on coffee alone or offer some baked goods like croissants and cakes along side it. I already compiled a list of great specialty coffee shops in Barcelona that do exactly that. During my last city trip here I skipped the sightseeing and made it my mission instead to find great breakfast and brunch spots that serve quality coffee! Here are three recommendations for starting your day the delicious way! In Poblenou industrial realities and remains mix with innovative ideas and new developments. In a matter of years the neighbourhood became Barcelona’s creative hot pot and a coffee lovers paradise. Since May 2018 Poblenou has its very first New Zealand inspired brunch café, making it an even more desirable destination. Judit from Hungary and her husband Jay from New Zealand made quality their highest priority. Having worked in the yachting industry beforehand they had to deal with crazy demands on a daily basis. This experience has shaped them to set the highest standards for their own endeavors. Poached eggs on avocado toast with goat cheese and cherry tomatoes, yum! All time Kiwi favourites such as Cornfritters are as much part of the menu as innovative creations like Kimchi pancakes or toasted sourdough with goat cheese, figs, honey, truffle oil and rosemary. It goes without saying that apart from mouth-watering brunch dishes, you’ll also find some of the best coffee Barcelona has to offer! At Little Fern Cafe Nomad is the roaster de la casa both for espresso and filter. The combination of great music, food, coffee and service make this the best brunch cafe in Barcelona! Roast Club Cafe have just celebrated their 2nd birthday in the neighbourhood of Eixample. It is a project by Iker Zago from Italy, who has poured all his passion for coffee into the small café. During breakfast and brunch hours it fills quickly, but guests are encouraged to share tables when possible. The atmosphere is extremely friendly and the guys working the bar have a nice word for everyone who enters however busy it may get. Healthy power bowls are a specialty of the house, as are bagels and tostadas with clever toppings. But what would breakfast be without coffee, am I right?! The Roast Club surprises guests every week with a different guest roaster. At the moment Lippe Kaffe from Oslo are making an appearance, as have La Cabra and Ditta Artigianale in the past. From next month the cafe is joining the club of roasteries, when they start taking roasting into their own hands. La Masala Cafe is a tranquil breakfast and brunch spot in the La Ribera/Sant Pere area of Barcelona. The brunch menu holds a number of different vegetarian sandwiches and tostadas that are freshly prepared upon ordering by co-owner Alejandra. Yoghurt with musli is another available breakfast option! All coffee is espresso based and brewed with single origin beans by Nomad. Alejandras partner Kunchok, who is Tibetan, is not only great behind the La Marzocco, but prepares a genuine Masala Chai as well. Cosy up on their couch and enjoy! After leaving Chiang Mai I knew, my Instagram feed would never be the same again (unless I come back here, which I did eventually). I’ve encountered such a vibrant community of coffee and design folks pushing each other to be innovative and cutting-edge - and this is true for both the design of the food and drinks menu as it is for the interior design. Chiang Mai’s creative coffee bubble is one that is active online as much as offline. While coffee shops bring exactly the right playground for photographers and design lovers to the city of Chiang Mai, Instagram is where it’ll all be showcased. Some great photographers from Chiang Mai to follow on Instagram are @bankpyt, @torthanit and @seandalt. I have already put together a list of the best specialty coffee shops in Chiang Mai. In this article I want to focus on specialty coffee shops that apart from brewing great coffee have put emphasis on interior design and branding. Here’s which cafés to visit if you want to be part of this creative community. Thanit Suvanish, founder of The Barisotel by The Baristro, is revolutionizing Thailand’s coffee scene one coffee shop at a time. With four stores opened in Chiang Mai and one recently opening in Ban Bang Phra near Bangkok, he is spreading his love for design paired with good coffee all over the country. Apart from an impressive following on Instagram, Thanit has a hand for unique flavour combinations and innovative interior concepts that he expresses not lastly through an extensive signature drink menu to be found in all of his cafés. Be prepared for Charcoal Latte Creamcheese, Pink Panther and B Americano. The Barisotel by The Baristro, a space almost entirely kept in white, is housing a boutique hotel and spacious coffee shop in the Nimman area. Thanit loves Minimalism and strongly considered how all elements would interact with each other in the café. Bouquets of flowers and single green leaves set accents here and there, as do the wooden legs topped with marble table boards. Otherwise the white walls and tiles set the perfect plain background for photographing the sophisticated drinks and deserts. If you feel inspired and would like to hold a private photo shooting here, it is possible for a small fee. The second floor is predestined for this. Be prepared for crowds of tourists bringing cameras and all sorts of accessories though as this location is definitely an Instagram favourite. The latest addition to Chiang Mai’s Baristro family is The Baristro at Ping River, which opened up in January 2018 in the North of Chiang Mai. Its bare concrete walls harmonize well with the vintage feel emitted by some of the objects placed around the open space. The counter and coffee equipment are all too familiar as they come in the same immaculate white as seen at the Nimman location. What really makes The Baristro coffee shops stand out for me is that the design appears effortless and simple, and yet every detail is set up to fit in the picture as a whole. The location by the water guarantees a relaxed coffee break, whether you decide to stay inside or make use of the outside garden. Transit Number 8 was inaugurated in December 2018 and is another incredibly sleek project by Thanit Suvanish, the founder of The Baristro. His fable for minimalist and white-washed design found a new outlet with this coffee shop located in a residential neighbourhood close to Chiang Mai’s Airport. The proximity to the city’s major transportation hub certainly served as an inspiration for the ‘transit’ theme. From the staircase that resembles an escalator to the rooftop window allowing a glimpse at the sky, every detail has been carefully planned. The sound of the passing planes makes it feel, as if one was sitting at the airport of the future. You’ll find a selection of medium and dark roast coffee in the grinders to make your stop-over here as delicious at it is eye-pleasing. Being a transit passenger has never felt more elegant. Cottontree Coffee Roasters was born in 2015, when the couple Ton and Fai merged the English translation of their Thai names into one while pondering over how to call their first coffee shop and roastery. The warehouse structure housing Cottontree is based in Green Hill Place, a condominium behind Maya shopping mall in the Nimman area. What makes Cottontree stand out is the industrial feel coupled with warm wooden tones and features. All furniture is hand made by Fai’s father. Ton and Fai wanted to create a space to breathe and unwind, hence you’ll find high ceilings and plenty of green plants. The roaster occupies a designated space behind glass windows in black frames. And it wouldn’t be a Chiang Mai coffee shop if there wasn’t a nice selection of photogenic signature drinks on the menu along with your regular espresso or filter based favourites. Maled Coffee Roasters is a coffee shop and roastery run by Fuu Kao Paanratee and located close to Chiang Mai University. She created an otherworldly white space with black interior setting visual accents on bare walls. It’s minimalism at its best! Despite the combination of black and white, Fuu wasn’t going for an elegant look. She wanted Maled to be simple and practical. This showcases in the design of a rather pragmatic seating area with high functionality. Signature drinks such as the ‘Jelly Black’ and ‘Blue Moon’ are adding another dark twist to the heavenly cubicle. Looks more like a movie set than a coffee shop, am I right? The space can be rented for shootings. Yellow Crafts is a coffee shop that specializes in drip coffee, homemade soy milk and all things yellow. From pumpkin lattes to egg dishes or orange juice with filter coffee you’ll find that the menu is as unique as the architecture and design of this café. Behind a giant glass door lie all white walls and floors, metal legs holding concrete table tops and a bit of yellow here and there to seamlessly complete the colour palette. Consistency is at work here! What can I say, eccentric is the new cosy. ONCE MORE is located in the old town of Chiang Mai and is the perfect starting point for café explorations in the city. In fact, you can start right here, as a café and craft beer bar are part of the hostel. Two pod-style dorm rooms host 12 guests each. The dorm rooms are designed in a way to offer privacy despite sharing the room with so many people. The capsules with curtains are spacious, include two plugs and a little shelf for personal belongings. Lockers are located outside of the room and there are separate bathroom areas. I recommend to stay in one of the private rooms though. They are very affordable (between 800 and 1100 Baht per night) and the simple yet comfortable design will really add to your Chiang Mai experience. I found the downstairs café area to be airy and inviting. I could tell that the owners have a background in architecture and interior design. Expect contemporary design coupled with comfort and cosyness . Bare concrete walls - check, plant pots - check and lamps hanging from the walls above each table - check. When it comes to the café menu ONCE MORE is going with the trend and has created innovative signature drinks mixed with coffee or Matcha. The coffee is from Laos and it’s not specialty grade, but the barista Blacky knows her stuff. Check here for the latest rates and promotions. Check out my other travel and coffee guides in Thailand! When the World of Coffee and World Barista Championships 2018 took place in Amsterdam, coffee enthusiasts and professionals from all over the world came flocking to the city known for its long-stretching canals and charming architecture. When they did, they found a considerable coffee scene ready to show them a good time! Working as a reporter for Coffee T&I magazine I spent most of my time on stage during the World Barista Championships and there was little time for cafe hopping. But like many other event participants I extended my stay to spend the weekend exploring the local coffee scene. Here’s where where I bumped into the pro’s having flat whites and filter coffee during and after the World of Coffee in Amsterdam. Coming to Amsterdam as a specialty coffee devotee and skipping the Scandinavian Embassy is like an art lover not visiting the Van Gogh Museum. This sophisticated enclave of Nordic coffee culture is setting high standards for both coffee and food since 2013. Scandinavia's best roasters, homemade baked goods and breakfast options are all under one roof, coupled with excellent service and Nordic design. Upon visiting the shop during the World Barista Championship 2018 together with Coffee T&I's chief editor Nicole Ou, we were advised on which coffee to opt for according to our breakfast order. It is definitely true what they say: "At Scandinavian Embassy coffee and food unite in a intimate Scandinavian setting."! Monks Coffee Roaster is a project run by Patrick, an extremely friendly Irish man of many talents. Before opening Monks in 2016 he spent a long time in Australia where he found the inspiration for creating his house blend. While he still relies on friends for roasting his coffee, he’s busy building his own roastery to take the craft into his own hands soon. The coffee menu at Monks surprises with real treats, such as Port of Mokha coffee from small-batch lots in Yemen. Unfortunately, it was already sold out when I visited. Sometimes good coffee just isn’t enough. So how about an excellent wine collection,innovative dishes and literally the best cinnamon rolls in town? 4850 has it all and the beautiful design is just the cherry on top of the cake. With a great selection of Nordic coffee roasters you’ll have no trouble finding a great pour over or espresso to complement your meal. A delicious piece of New Zealandish café culture has found two outlets in Amsterdam and caters to the cravings of brunchers and lunchers with generous portions of pure delight. The Brazilian-Kiwi couple running the business works with Ozone Coffee from London and has an extensive selection of mouth-watering cakes in the vitrine, including some Kiwi classics. On weekends this place is absolutely packed so plan in some waiting time. Siebrand Van Hengel has two passions: coffee and music. In his multi-roaster cafe Black Gold he combines both into one rhythmic interplay of steaming milk and cracking vinyls. From The Barn to Drop and Amsterdam based Sweet Cup - Siebrand has a hand for selecting fine coffee roasts for his loyal customers. The predominantly wooden interior makes for a cozy atmosphere to sit a while and bounce your head to the beats. Sweet cup is a coffee roastery and cafe run by Paul and Lisa. While everyone else goes Nordic, their approach over the last 2,5 years has been to produce a balanced cup of coffee with not too much acidity. Lisa’s secret super power is baking and her carrot cake is a pretty magnificent thing. Whether it’s a great cup of coffee you’re after or you’d rather celebrate tea o’clock, Toki is the place to go. Having been committed to serving only specialty coffee from Berlin based Bonanza from the start, coupled with an excellent selection of loose leave tea, this Instagram darling of a café with it’s marble interior is a save address for spending a cosy afternoon. The location of Lot Sixty One couldn’t be more characteristic for Amsterdam. Set right by one of the many canals this corner cafe stretches over two floors with rustic wooden interior and a coffee roaster located in the basement. The coffee is nothing short of excellent, which is probably why this place is a crowded affair on weekends. Good thing you can find their beans in other places around town as well. The corner coffee shop and concept store Back to Black is run by Noortje and Inge, two passionate coffee professionials who took brewing and roasting into their own hands. Despite the name, this place is a great address for purists as well as those who prefer a milky coffee drink. I know it is hard to leave the pretty city center of Lucerne, but trust me when I say, Café Tacuba is worth the extra mile. Located in a residential area south of the center, it has a reputation not only for being one of very few specialty coffee shops in town, but also because of the eternal sunshine running it: Manolo from El Salvador! Café Tacuba replaces Grüezi with Hola and furnitures with coffee bags. The menu is plentiful and fully transparent in terms of origin and variety of the coffee. Manolo used to work on his family's coffee farm back in El Salvador and knows first hand how much effort coffee farmers put into developing the quality of their beans. One and a half years ago he opened his roastery and café together with business partner Nick. "The first six months I thought to myself, what am I doing here. But slowly people started coming.". Manolo sources most of the coffee directly from 10-15 farms in El Salvador, including his family's farms. "I have to roast the coffee darker than I'd like to, because it is what people want", he says while pulling a shot of espresso for me with a Pacamara natural from the farm Bella Vista. His coffee ranges from 84 to 91 points according to the standards of the Specialty Coffee Association. Even though Manolo only sells a filter coffee every two weeks or so, the menu holds plenty of pour over options, from Chemex to V60, Aeropress and Syphon. A couple of times per year Manolo travels back to El Salvador to support farmers in developing their coffee. Just recently his family started planting coffee trees of the Geisha variety at 1400m. It might be due to his background as a coffee producer, but Manolo's appreciation and passion for coffee is contagious. At Café Tacuba guests can learn about coffee and origin first hand, sit by the roaster or simply enjoy a cuppa in the lush outside garden. The only other place selling Café Tacuba in Luzern is Koffeinshop. While not a coffee shop, it is a great address to get your coffee equipment from. These guys sell espresso machines from Rocket, ECM as well as Rancilio and a great variety of pour over methods. Although not entirely a specialty coffee shop, the café and bar Kaspar does serve single origin espresso and milk based drinks exclusively with beans roasted by Miro Manufactura de Café from Zurich. Co-owner Mahyar told me that the reactions to their coffee from Honduras is divided, there are those who love it and the more traditional coffee drinkers who are sceptical. Kaspar is located close to the train station in Lucerne. The opening was only in May 2018 and already the place was buzzing when I visited. 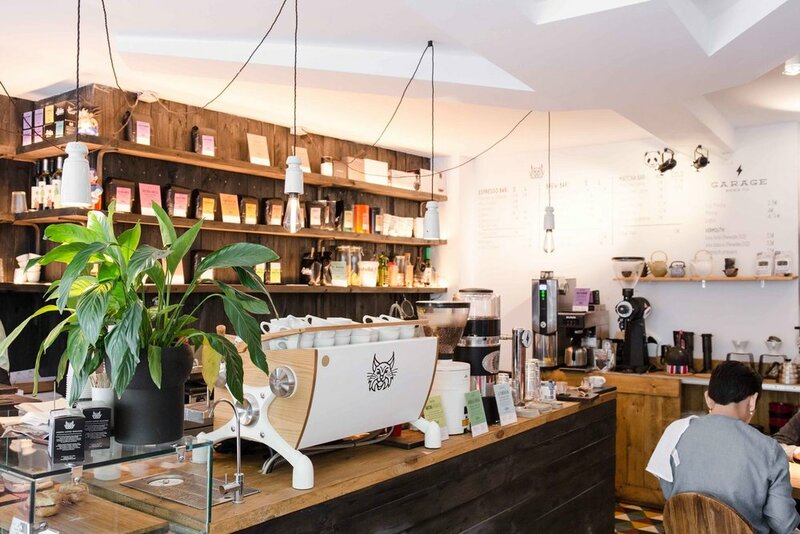 The specialty coffee roastery hässig & hässig is operating since 2015 in Bruchstrasse 44, where they share a space with the shop Portmanngrafik. It is open from Thursday to Saturday and coffees can be bought directly at the store. Nothing is more frustrating for a specialty coffee enthusiast than spending the perfect holiday in a breath taking place like, let's say Zermatt in Switzerland, without having a single specialty coffee shop within reach. Either you bring your coffee beans and DIY or you just open up a coffee shop yourself. While this is not quite what happened to Marián, it is getting pretty close. 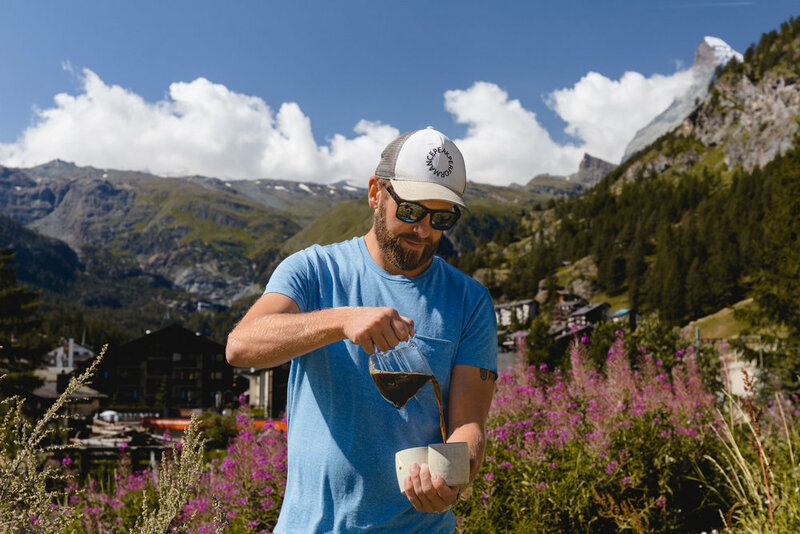 Marián is the founder of Zermatt Rösterei, a specialty coffee roastery currently located in a workshop close to Zermatt station. Having gotten quite passionate about hiking in the mountains, I didn't think twice to combine a tour of the roastery with visiting her majesty the Matterhorn. Marián, who is originally from the Czech Republic, moved to Zermatt 3 years ago as a private chef from the UK, where he was running Michelin star kitchens and cooked for celebrities such as Nicole Kidman or George Clooney. Something that always bothered him throughout his career was the fact that coffee service was often overlooked - even by the finest restaurants. Through close contact with baristas and mixologists coffee has been on his mind for quite some time as he contemplated changeing careers. So it happened that he already developed his business plan to open a coffee roastery as early as 5 years ago. The plan came into being in May 2017. The camp ground I stayed at when visiting Zermatt during my Switzerland coffee tour was very close to the roastery, so I found myself on a Sunday morning crawling out of my tent into Mariáns workshop. The space is compact, to say the least, and every inch seems to have a purpose. Marián grabbed me a chair, placed it between coffee bags lining the floor and poured me a delicious Kenyan filter. I could feel his excitement while he explained the concept behind the roastery and his future business plans. "I'm building a coffee utopia in this place", he said as he fetched four different business cards from a drawer. The roastery will move to a proper space by the end of the year, together with a coffee lab & showroom for espresso machines. With the same breath Marián will open a restaurant called "Aroleid Kollektive" with a full brew menu and a ceramic workshop. To my question whether he ever sleeps he replied with a smile "It's our goal to be the most comprehensive coffee solution in all of Switzerland." Marián sources his coffee from a green beans dealer in Zug. "There is no limitation to the service we offer to people." He develops special lines and blends to fit the espresso machines of his clients, which sometimes results in adding a percentage of Robusta, if they ask for it. "Everyone who comes to Zermatt is ready for specialty coffee!” he says. Marián is hopeful that with time and efforts from all local folks the coffee and service culture will improve in the near future. "This place is always busy, so far there hasn’t really been a need for change." Indeed Zermatt sees tourists coming from all over the world anytime of the year. While in summer Marían delivers his coffee on an electric bike (there are no cars allowed to enter Zermatt) he switches to a sledge in winter time. If you are planning to visit Zermatt soon, by the end of the year you'll be able to combine hiking or skiing with a coffee workshop, a ceramics workshop or simply an outstanding dinner followed by quality coffee. There are already a few places in town serving coffee roasted by Zermatt Rösterei. The restaurant Sonnmatten offers cold brew and pour over. They brew your Chemex right at the table for you. The café Petit Royal is using a special blend by Zermatt Rösterei with 30% Robusta and 70% Brazil. Homemade is currently featuring Zermatt Rösterei's single origin from Brazil. Ask specifically for the beans, or else you might be served coffee from a different roastery. It is a really nice spot to unwind after a day of hiking and lots of home made goodies are on display at the bar. Ten years ago I visited Lisbon for the very first time. Back then, there was no sign of specialty coffee shops or concept stores, but the same vintage trams were roaming the evermore picturesque alleys of the old town. In recent years though, Lisbon has become a hub for creatives and young entrepreneurs from all over Europe. This has also manifested itself in the increasing number of coffee professionals that have introduced an approach to roasting and brewing coffee that is a lot different from the traditional ways. Coffee is deeply rooted in the everyday life of the average Portuguese, stemming from colonial times when coffee was heavily imported from Brazil. Most people drink commercial coffee by one of the industrial coffee companies, like Sical or Buondi, who produce dark roasted blends of Arabica and Robusta. To counter the bitterness, spoons full of sugar are added to either a bica (long espresso) or galão (long espresso with milk). While the specialty coffee scene is still relatively small compared to other European capitals, it is doing a great job at challenging the status quo and diversifying the local coffee landscape. My prediction is that the third wave movement will soon have Lisbon in its grip! I met some amazing coffee people here and will tell you all about the who is who in the coffee world in this article. Part of my stay I spent in Casa C'Alma, a bed & breakfast that looked like it came straight out of a magazine. I absolutely have to share this discovery with you! So let's start with a cup of coffee, or two. Copenhagen Coffee Lab was founded in 2013 by Jacob Karlsen and Allan Nielsen in, you guessed it, Copenhagen. Two years later they ventured into warmer climates, and brought the Nordic approach to roasting and brewing coffee to Príncipe Real, a neighbourhood in Lisbon that is home to concept stores, innovative restaurants and cafés. The beans are shipped from Denmark and the menu holds regular third wave coffee drinks, such as espresso, flat whites or drip coffee. The atmosphere is easygoing and relaxing. Nothing must, everything can! Whether you want to work away solo on your laptop or meet friends for breakfast, there is space, there is a great approach to customer service and delicious coffee of course. Two single origins rotate for espresso and various pour-over methods are available. My personal highlight were the delicious Danish cinnamon buns, for when I overdosed on pastel de nata. By January 2018 CCL will venture into two more Lisbon neighbourhoods, with two new coffee shops opening in Alfama and one in Belem. Imagine you'd find all your favourite magazines in one place, together with great coffee, friendly people and in the most beautiful environment. Sounds too good to be true? Then Hello, Kristof will show you otherwise. This little gem is the work of Ricardo, a graphic designer who knows about the needs of them freelancers and digital nomads. No wonder I felt right at home here. Hello, Kristof works exclusively with the local specialty roastery and SCAE training center Academia do Café, which was founded by Sandra Azevedo already in 2011. Whether you feel social and want to enjoy your coffee at the communal table or choose one of the more private tables by the wall, you'll find your comfort zone for sure. One of my favourite Lisbon discoveries was Montana! It's a coffee shop, urban art gallery and graffiti store located by the river right next to Cais do Sodré metro and ferry terminal. I met two lovely coffee professionals there, Ana and Liza, who shared their coffee story and some insights into the local coffee culture. Specialty coffee was mainly introduced by foreigners, Ana tells me. She joined Montana a few months after it first opened in March 2016 and has learned a great deal about specialty coffee since. She is preparing to take part in the barista championship next year and is trained by Liza, who is actually about to start her own micro-roastery on the other side of the river. Obviously I had to find out more (interview soon). The exhibition currently on features the work of Alexandre Farta aka @vhils that evolves around propaganda from Vietnam and Cuba. The culinary company of art and graffiti is Cafè de Finca, a roastery from Barcelona. Whether you crave a chemex, aeropress, V60 or a good old espresso, you're in very capable hands here! Once you soaked in all that urban atmosphere inside, the sunny terrace will maximize your holiday vibes with great river views outside. WISH has two locations in Lisbon. For one there's the Wish Slow Coffee House at LX Factory, an urban playground for artists, foodies and, you guessed it, coffee lovers! It is definitely worth it to spend an afternoon exploring this creative island that used to be a manufacturing complex. The Wish coffee shop is right in the heart of it, with an adjacent concept store, and surrounded by grape tendrils. The second location is in the city center on the second floor of a beautiful historic building, with a concept store on the ground floor, and right across from the Trindade theater. (Although I’ve been informed that this location has recently closed.) 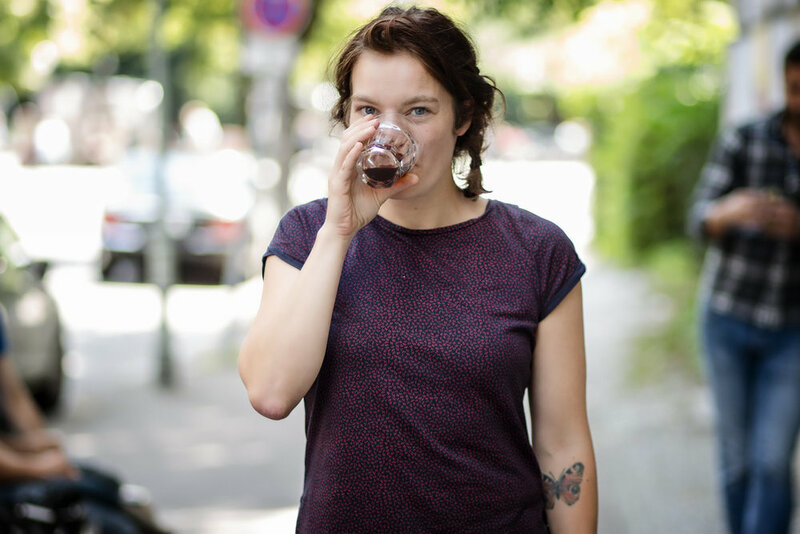 Both places brew Five Elephant exclusively, stemming from several encounters at coffee fairs between the owners Margarida Eusebio, Barbara Rodrigues and the Berlin based roastery. The name says it: you'll definitely find hand brewed pour-over on the menu, but barista David working at LX factory location - aka @thecoffeehuman - swears on batch brew. Apparently, it is a popular option for both tourists and locals over there. I long thought that coffee is going to be the new wine, so it made total sense to me when I heard about The Mill specialising in both. Café during the day and vinho during the night is their mantra. Every time I stopped by the place was absolutely packed! Their delicious avocado toasts might have something to do with that. No exaggeration, the breakfast is the best in town! Or should I say breakie? The owners are an Australian-Portuguese duo that brings together the best of both worlds. The Mill also roasts their own coffee and offers two single origins for espresso. While serving specialty, the roast is more adapted to the liking of the locals, hence leaning to the darker side. Coffee enthusiasts who are also foodies, watch out, this one's for you! Bowls&Bar has opened up only a couple of weeks ago and is run by Kate, a Russian native who fell in love with Lisbon and its people. Healthy and innovative dishes are her signature! The menu is inspired by Hawaiian Poke and holds traditional dishes with a modern twist. As Kate prioritizes quality not only when it comes to food, she invited one of Portugal's greatest specialty coffee roasters from Porto to join the game. 7groaster beans are brewed on a vintage espresso machine from good ol'Italy. I had the pleasure to try the Barú Black Mountain single origin from Panama as an espresso, boosting notes of chocolate, caramel and papaya. That's it, I'm hooked! Last but not least, I mentioned before that I met quite a few inspiring coffee people in Lisbon. Among them was Antony Watson, who has launched a new specialty coffee roastery called Olisipo together with his partner Sofia Gonçalve . A few years ago Antony traveled all the way to Ethiopia by bike to explore various local coffee cultures. This journey not only inspired him to write the book 'Bean on a Bike', but also to join the team of Vagabond Coffee Roasters in London upon his return, before making Lisbon his new home. Read more about Olisipo's unique approach and community engagement in this article I wrote for Sprudge. You've already read about a number of good reasons for booking a flight to Lisbon right now! Now here's another one. Staying at Casa C'Alma was like living in the home I always wish I had. This 5-room bed & breakfast is located in one of Lisbon's most desirable neighbourhoods, Príncipe Real, a stone's throw away from Copenhagen Coffee Lab and close to alternative designer and concept stores. I loved its distinct, minimalist interior design, that never compromised on comfort. The owner Rafael prepared delicious breakfast in the morning and made sure, I knew about great places to eat and hang. If you want to feel at home on your travels and be located close to some of the best coffee shops in town, then this is your place! Check here for latest offers and availability! Specialty coffee has become quite the buzzword in Greece's coffee crazy capital. I've got to witness the growth of the coffee community first hand, while coffee touring Athens in the summer of 2016, 2017 and 2018. I am excited to present you the results of these caffeinated adventures: a specialty coffee guide featuring the real deal - new and established specialty coffee shops in Athens! I remember stepping into Coviar for the first time and thinking I must have the wrong address. What appeared in front of me looked more like the elegant lobby of a five star hotel than a coffee shop. Upon nervously looking around for something that seemed familiar I spotted the bar with syphons lining up and finally the friendly face of Chris Loukakis, one of the co-owners. So finally, I was in the right place I thought to myself, but completely under-dressed for such a fine venue. Upon learning more about this newly opened establishment from Chris I realized, Coviar is meant to provide an extraordinary coffee experience for everyone. Professionalism is high on the agenda, which is no surprise, given the fact that Chris has 13 years of experience in the coffee industry. Coviar is a combination of a coffee lab, roastery, café and bar. For the moment, a Colombia and a Brazil are on the menu, both beautifully balanced coffees that arouse curiosity of what's to come. In August 2016 I met Alexandros at Nomad, where he was working as a roaster at the time. One year later I had the pleasure to see him again at his newly opened specialty coffee shop and roastery in Tavros district. Handpickers is a passion project he runs together with his partner Natalie and friend Dimitris. Both Alexandros and Dimitris have won several national coffee competitions and bring many years of experience to the table. You could really feel that they put their hearts into this place and I've seldom experienced such hospitality! The idea for the name came about when Alexandros visited Kenya in November 2016 together with Nordic Approach. It reflects the deep appreciation he has for the hard work that coffee growers and pickers carry out at origins. A beautiful painting on the outside wall of a women picking coffee confirms this! The inside space holds a couple of stools by the bar, and while you'll be in extremely nice company, lot's of folks drop in to take away. Now let's talk coffee! The signature espresso is a blend with 60% Brazil and 40% Colombia but there was also an option for a single origin Costa Rica natural. For filter Handpickers are sticking to a fully washed Kenya Nyeri with a natural sweetness and citric acidity, which is what I opted for. Even though Tavros is probably not on your list of places to visit in Athens, you could easily stop by on your way from or to Pireaus port by simply getting of the metro for a shot stopover. The second venture by the masterminds behind Mind the Cup in Peristeri is a treat for all senses. Conveniently located close to Syntagma square in the center of Athens it starts you off with breakfast in the morning and gets you through the night by serving fancy cocktails while looking plain gorgeous. The person smiling at you on the picture above is Nikos, barista and roaster at Peek a Bloom, who had already been with the Mind the Cup family before building up this new place. That very day we met I was lucky to be surrounded by 3 latte art champions! Nikos had won the 2015 Latte Art Championships in Greece, Arnon Thitiprasert, who is the World Latte Art Champion 2017, was visiting from Thailand and Michalis Karagiannis was runner up at the same competition. When the latter two were deep in latte art discussions I picked Nikos brain about their coffee. Peek a Bloom are sourcing coffee beans from Nordic Approach and roast in a separate space behind the counter. Thanks to the large windows you'll get to see all the action though! On the counter a Black Eagle by Victoria Arduino is spreading its copper wings while the white and blue tilings remind us that we're actually in Greece (Yay!). For filter you can expect a nice selection including Chemex, Aeropress and even a Syphon. Come day, come night - The Underdog has got you covered! Set in a picturesque pedestrian street close to Thissio metro station, it's not only coffee shop, roastery and bar all in one, but also home to 3 World Coffee in Good Spirits Champions and one Runner-Up! There is really no limit to the professionalism and innovation you'll encounter here. I met the 2016 champion Michalis Dimitrakopoulos during midday hours and given the heat I felt it was best to stick to coffee. He charmed me with a really tasty flat white, followed by a delicious cold brew. Their shop currently holds 9 different espresso roasts and 5 for filter. Depending on the day you'll be enjoying single origins from Brazil, Colombia, Panama, Ethiopia or Kenya. If you come hungry an extensive brunch menu will take care of your cravings! This coffee shop underwent some changes in recent years. At the time of my first visit to Athens in 2016 it was still associated with Kudu Coffee Roasters. This summer I found out they went separate ways and are now roasting under the name Mr. Bean Coffee Roasters. The person roasting behind the scenes is Konstantinos Perpinias, who had already worked with Taf during their early beginnings. What stayed the same is the gorgeous interior and great location in Exarcheia! Lot's of natural light and outside seating make it a great hang out spot. Mr. Bean's house blend is a chocolatey brew from Brazil and Guatemala. Apart from espresso there are plenty of brewing options available, including cold brew, as well as sweet treats to accompany the coffee. And if you want to try my next recommendation, you jut have to cross the street! Even though I feel like Taf Coffee needs no introduction, a guide to specialty coffee shops in Athens wouldn't be quite right without featuring them. The roastery was found by Yiannis Taloumis already in the 90's. It evolved from roasting the traditional Greek way to becoming a pioneer in bringing third wave coffee to Greece and finally to the capital. Taf was actually the first specialty coffee shop to open in Athens 2009. For those who want to try Taf coffee closer to the center of Athens, Duo Goulies & Duo Mpoukies is the perfect place! It is located close to Panepistimio metro station and serves exclusively coffee roasted by Taf. Their quality standards as well as professionalism are equally high and not even the humidity in the room is left to chance. I found their baked goods and Greek yogurt to be excellent as well. Kaya is definitely not an easy one to track down. It is located inside a shopping complex called "Stoa Bolani" close to Syntagma and is a take away espresso bar run by a nice bunch of coffee professionals. You'll not only find that the coffee is very inexpensive, Kaya also has the highest number of grinders for espresso I have ever seen in one shop. Apart from their house blend, a nice range of local roasters and their single origins is rotating in a total of five grinders. It is the perfect place to drink yourself through Athens specialty coffee scene in just one afternoon! In this city guide I've introduced the most central coffee places, many of them are easy to reach from Syntagma Square. There are more great specialty coffee shops not featured here, such as Mind the Cup and Manor House in the Peristeri neighbourhood or Nomad Roastery in Chalandri neighbourhood. They are included in the map below.